Intel's 32-nm CPU: 4 GHz at 0.83 volts? | Its Madh !!! Home » Intel » Intel's 32-nm CPU: 4 GHz at 0.83 volts? What you say about this ! ? Some of the information of this processor is already revealed by an Asian overclocker. He is the first to test the overclocking capabilities of a Clarkdale and he went upto 4 GHz on air cooling. Coaler used just 0.83 volt to reach 4 GHz. 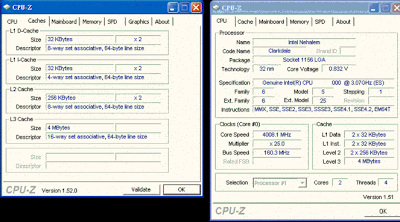 The CPU-Z picture also revealed the details Clarkdale family and processor is a Dual core which has 4 threads , L2 cache of 256 KB per core ( same as Nehalem family), and 4 MB of L3 Cache.